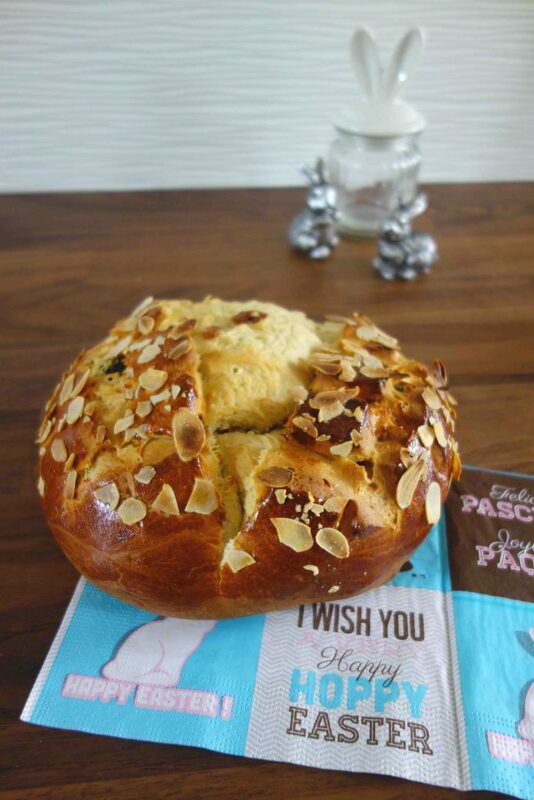 Easter is right around the corner and this year I definitely wanted to make a typical German Easter cake. At the farmers market I found yellow jumbo raisins and thought those were perfect for it. Of course, I wanted to do a spelt version of the Easter cake, because I love spelt flour. It is so much tastier than wheat flour… My Easter cake doesn’t look perfect, but it tastes delicious. So, head over to the next supermarket to buy everything you need and get going! First, heat the milk until lukewarm and dissolve the yeast in the milk. Then you melt the butter and put it aside to cool. In the meantime mix the spelt flour with the raw cane sugar and a pinch of salt in a big bowl. Pour in the milk-yeast-mixture, the melted butter and two eggs. Work it with the dough hook until a nice and smooth dough forms. Last but not least work in the raisins and let the dough rest for one hour at room temperature. It should double its volume. Next, you form the dough into a nice ball and let it rest for another 30 minutes at room temperature. In the meantime you can preheat the oven to 190°C air circulation (or 210°C top and bottom heat). When your Easter cake has rested, take a sharp knife and cut squares in its surface. Then brush it with an egg yolk and milk mixture and sprinkle with almond flakes. Bake it for ten minutes and reduce the temperature to 170°C (190°C). Bake it for another 15 to 20 minutes until golden brown and don’t forget to test it with a skewer!